“This is the spear I use to kill the lobsters and tuna!” exclaimed fisherman Javier as he enthusiastically reenacted the motions he used for his late-night fishing adventures at sea. When I met Javier, I was quite impressed by his stories and feats. 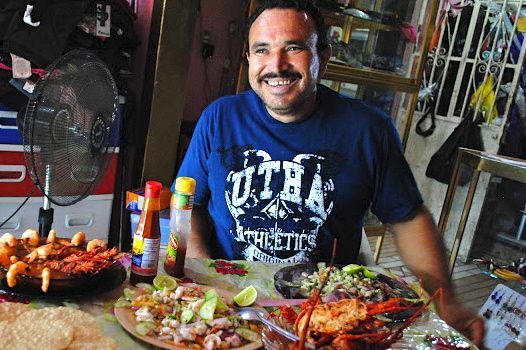 He not only catches fish by himself in the middle of the night, but he also runs a small business selling his ceviche. Meeting Javier has helped me begin to understand the project that I will be in charge of for the next five weeks. My first week at Human Connections has been nothing but a pleasant and fulfilling experience. While walking through Guadalajara’s busy streets last week I never imagined what Bucerias would be like. On the first day, I found the town to be charming and surprisingly multicultural. Bucerias is a prime example of a small Mexican town completely transformed by recent waves of tourism. The town has not only grown through tourism, but it has been changed dramatically. I noticed that new developments seems to tower over older structures and that the town’s economy is overwhelmingly linked to tourism. Fishermen like Javier need to not only work ceaselessly to collect their fish, but they must also do their best to attract sales from international tourists. We were also very lucky to visit Sayulita over the weekend. I found the town to be extremely fascinating and the atmosphere quite enjoyable. The town is quite different from Bucerías. It is busier and has a younger tourist population. Although the town seems to face different issues than Bucerias, I think it would be great if Human Connections would work closer with artisans in Sayulita.